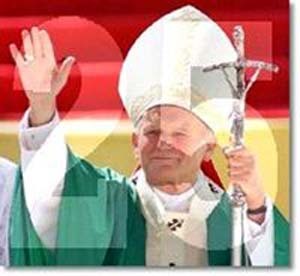 THE WORLD’S POPE – I am writing this column as the world and the Conciliar Church finishes commemorating the 25th anniversary of John Paul II’s election as Pope with multiple celebrations. We witnessed the ensemble of revolutionary media – TV, radio and newspapers – plus liberals of every bent – Jews, Buddhists, Muslims, Schismatics, Protestants, Communists, Socialists, Agnostics and Masons – pay their sincere tributes to Karol Wojtyla as the most expressive leader of this new millennium. They all love him and feel represented by him to some extent or another. I am having difficulty keeping up with the countless articles, news reports, and photo galleries featuring JPII in the magazines and newspapers I receive from here and different countries. The 25 years of his pontificate can be judged by applying to them the words below. Our Lord said this about His disciples: “If you had been of the world, the world would have loved its own; but because you are not from the world, but I have chosen you out of the world, therefore the world hateth you. Remember my word that I said to you: The servant is not greater than his master. If they have persecuted me, they will also persecute you” (Jo 15:19-20). The Middle Ages was indisputably a time profoundly influenced by the Catholic Faith. Notwithstanding, the greatest Pope of that time, St. Gregory VII, was hated, persecuted and died in exile. Even to this day, his remains are buried in his place of exile, almost forgotten in a basilica in Salerno, South Italy. For all these centuries no one has advanced the idea of giving greater relevance to his sepulture – to transfer his remains in honor to the Vatican, for instance. I remember traveling to Salerno for the sole purpose of visiting the gravesite of St. Gregory VII. I had to engage in a 20-minute discussion with a basilica keeper, who tried to convince me not to visit his grave, which was in a forsaken side altar. He insisted I venerate other saints in the basilica. After I slipped him some money, he became more open to my arguments. With effort, he fumbled some ten minutes searching for the forgotten key to the rusted padlock and chain that locked the grilled side altar. Judging by the quantity of dust that had accumulated there, it had seen no use or visitors for some months. The relics of St. Gregory VII were placed beneath the altar, with no visible marker or memorial to alert visitors who was buried there. After recollecting myself and saying my prayers, the words of Our Lord mentioned above came to my mind, and I reached an obvious conclusion: These words apply indisputably to the life of St. Gregory VII. He was one of Our Lord’s disciples, and for this reason he was hatred, persecuted and died in exile. Even to this day he is not a popular Pope, and his remnants are forgotten. He was a true disciple of Our Lord, a true Pope. It all made sense, and my admiration for him increased. TRADITIONALIST MARRIAGE WITH THE VATICAN – During the last few years a dialogue between some Vatican officials and the leaders of a particular traditionalist movement has been taking place. The Vatican tried to seduce this party to accept Vatican Council II and the New Mass. The traditionalist leaders have flirted with the idea, somehow imagining that they can rein in the Holy See to return to a pre-Vatican II era. The friendly dialogue advanced to a romantic date, the date became an engagement, and recently the marriage was said to be imminent. According to good sources the terms of the marriage have been fixed as such: the Vatican will launder the irregular situation of the bishops of this movement, rubberstamp the priests ordained without permission, and allow them to say the Tridentine Mass wherever and whenever they want. A stable juridical situation will also be provided the movement to make their members feel comfortable inside the Conciliar Church. In return, this movement will accept Vatican II, the Liturgical Reform of Paul VI, including the New Mass, and promise to not raise any public polemic on these issues. It is probable that a new rite would be formed for the celebration of the Tridentine Mass, one similar to many Eastern rites that exist parallel to the official Roman Rite in the Catholic Church – the Maronite, Melchite, Russian, Ukrainian, Armenian, etc. That is, the New Mass will continue to be the official rite of the Conciliar Church, but the Tridentine Mass would be permitted as a part of a “Traditional Rite,” which would be in a gestation stage. The imagined return of the Holy See to the pre-Vatican II era is being fueled by the more conservative appearances assumed recently by some members of the Roman Curia. It is good to point out that it is nothing more than this, just appearances, since no changes have been made in the bad doctrine of Vatican II or to the Protestant flavor of the New Mass. Viewed in this light, it is interesting to consider a draft of a document prepared for the Congregation of the Divine Worship and the Discipline of the Sacraments, published as a scoop in the September 22 issue of Jesus magazine, a known Italian organ of the Pauline Fathers. This document has been expected for some time. According to Cardinal Arinze it will be published still this Fall and will encourage the celebration of the Tridentine Mass around the world in parishes where the faithful will request it from their Bishops (1). The draft, conservative in tone, proposed that clear distinctions be made between the priest and lay people; discouraged lay “pastoral assistants” from assuming roles during the Mass; made reservations about the presence of altar girls; forbade applause and dances during the Mass; and established provisions against distributing Communion to non-Catholics. The document was not approved, but sent back to the committee that wrote it for a new less conservative version (2). (1) Francis Arinze, statements to Inside the Vatican, June/July 2003, p. 14. (2) America, October 6, 2003, p. 4; on the issue of altar girls, see also National Catholic Reporter, October 10, 2003, p. 6. (3) The Tablet, September 27, 2003, editorial, p. 3. This marriage between the Holy See and traditionalists, should it take place, seems to be an important Vatican maneuver to swallow not only some leaders – who appear already to be in the game – but also, and especially, the numerous grassroots of that traditionalist movement. 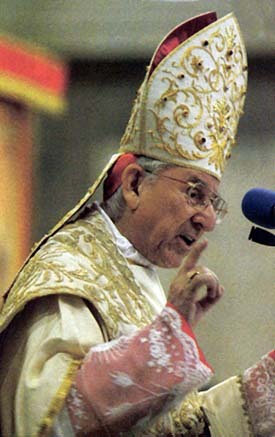 I don’t believe that the present day Holy See will give up any fundamental point of Vatican II, the Liturgical Reform, or the New Mass to please these traditionalists. I am sure, however, that it will try to give the impression that it is “converting” to woo as many good-willed but naïve persons as it can. I also have doubts about the good faith of those traditionalist bishops and priests who are abandoning good doctrine in exchange for a comfortable position in the Conciliar Church. In short, with or without a document regulating a more conservative New Mass and permitting the Tridentine Mass, I hope such a marriage will not take place. I also hope and pray that the grassroots of this movement will be clever enough to realize that the announced accord would be contrary to what they have been struggling for these last 30 years.